How guitarist Michael Amott (Arch Enemy, Carcass, Carnage) can switch from extreme, mostly melodic death metal, to old school melodic heavy rock is perplexing to me. But he does. Call him versatile. 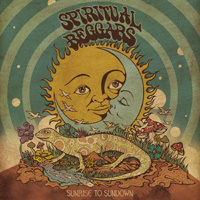 Spiritual Beggars has been banging the gong of classic Seventies heavy rock for 23 years, and now with their ninth album, Sunrise To Sundown. Since I haven't heard a Spiritual Beggars album in some six years, and my recollection of Return To Zero is rather fuzzy at that, this album, in some sense, comes as something new. My first observation is that the tunes within are funadmentally hard and heavy rock. The riffs are thick, sometimes fuzzed out and pyschedelic, the leads can be the same, but it's the bottom end, the bass and drums, that put the real density into these songs. Then that same density is embellished with old school Hammond organ, which swirls around each arrangement, embracing it like a morning London fog. Additionally, most every song has this steady, formidable, groove which is probably why Spiritual Beggars still gets labeled a stoner band. (It's not necessarily needed anymore.) Notable are Southern Star, Diamond Under Pressue or Hard Road, some ripping guitar in that one. Alternatively, probably just to mess with our heads, Amott and company put both speed and groove into What Doesn't Kill You for some heavy power metal rock (if that makes any sense). One final comment needs to made, and that concerns Ludwig Witt's drumming, which is quite masterful throughout. But the signature songs for him are Still Hunter and more so I Turn To Stone where his playing leads, even commands, the song. Rather impressive. As for that latter song listen for subtlety of the Hammond styling as well. Bottom line: If you're Spiritual Beggars fan, you will find Sunrise To Sundown another convincing and entertaining trip into classic melodic heavy rock. Recommended. 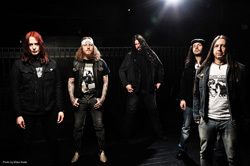 If you're Spiritual Beggars fan, you will find Sunrise To Sundown another convincing and entertaining trip into classic melodic heavy rock. Recommended.